If you, like most people, think we only experience marketing through our eyes and ears, think again! Have you ever walked into the fragrance section of a department store or duty free shop? Do you remember the last time you walked through the produce section of a grocery store? What about each time you open the door to your favourite coffee shop? 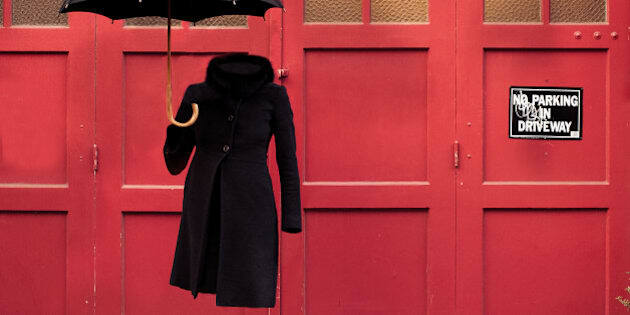 'Invisible' woman in winter coat with high heels and umbrella against red garage door. The best sales people sell without selling. The best marketing you don't recognize as marketing. If you, like most people, think we only experience marketing through our eyes and ears, think again! Have you ever walked into the fragrance section of a department store or duty free shop? Do you remember the last time you walked through the produce section of a grocery store? What about each time you open the door to your favourite coffee shop? Before your mind registers anything you see or hear, a much more powerful force washes over you. Have you guessed what it is? Smell! Think about it. You open that Starbucks door and the fresh, comforting aroma of roasted coffee beans fills your head. You must have it! In some cases, the scent is there naturally. But what you may not realize is that many companies are adding scent... as part of their marketing content! It may come as a surprise, but some of the big companies today have more to their branding than a logo and certain visual elements. They don't just look familiar, they feel familiar. Scent can be a major element of that familiar, often comforting feeling you get when you walk into your favourite stores and restaurants. These days, the best marketers are the ones that tap into all your senses. They are branding by smell! I have to agree with this one. The feeling you get from a brand often sticks with you more than anything else. Companies are taking this to heart, especially those who operate in a brick and mortar space rather than online. They are looking to these invisible marketing elements to create a very specific and memorable experience for their customers. As consumers, we've become overwhelmed by all the marketing, re-marketing and re-re-marketing. We've become almost immune to the ads and promotions we see everyday. As marketers, we need to look to roads less traveled; to techniques and strategies that break through the marketing clutter to have a real impact with consumers. That road is scent marketing. In marketing, the power of scent is associated with immediate or impulsive consumption. With the right scent, you can make someone feel present and consumed by the moment. A perfect example is ice-cream stores. 30 years ago, these stores smelled a bit like ice cream, but mostly smelled like whatever else was in the store. The refrigeration units, cleaners, vinyl seating, the shop next door. Today, most of them actually smell like waffles or fresh crepes because that aroma makes people feel comforted and, most importantly, like indulging in something decadent... like ice cream! Try this next time you're out: walk into some of the biggest fast food, coffee and accessories stores. Tap into your sense of smell. Make note of how you felt in each store and what smells you noticed. It's not just in retail. Scent marketing is at play just about everywhere. Ask a real estate agent about the best way to sell a house. They'll likely tell you to put freshly baked cookies in the oven because the scent of baked goods makes people feel at home. As you start to explore and take note of the smells around you, you'll start to realize the matrix of scent marketing you've been walking through all this time!